Since January, it looked like it was going to resume its place as the leader. But, just within the past three trading days, Netflix (NFLX) has slipped, perhaps feeling the weight of its big gains for the past couple of years, in the shadow of a new competing streaming-video service from Apple (AAPL)... not that investors were especially bullish on AAPL before or after it unveiled its new Apple TV+ on Monday. The surprising winner of late? Facebook (FB), actually. After suffering a small setback in early March, FB stock has outpaced all other FANG stocks, or FAANG stocks, since the middle of the month. It's been a tricky past few days getting a bead on these names, individually, and as a group. They were all more or less traveling in a pack coming out of the December drubbing. 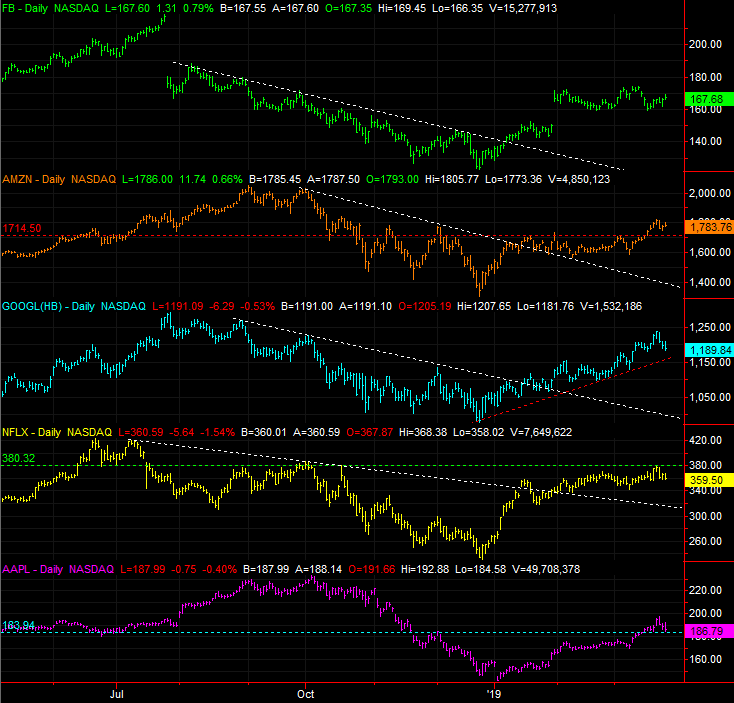 They've diverged since late last week though, led by (as was noted) Facebook and Amazon (AMZN). Amazon shares, in fact, have taken the lead for twelve-month performance. The relative performances imply Facebook and Amazon are good buys, while Apple, Netflix and Alphabet (GOOGL) are best left avoided if not shorted. That's not necessarily the case, however, when looking at individual daily charts of each. But, certainly many of the clues highlighted by the performance-comparison chart should be heeded. Take Netflix, for instance, plotted in yellow on the graphic below. Not only is it losing ground, it peaked at the same technical ceiling that was trouble back in September. Apple, meanwhile, is testing a support lines around $184 that also used to be resistance. It's still holding up though. As for the others, the bullish thesis still applies... even for falling Alphabet shares. 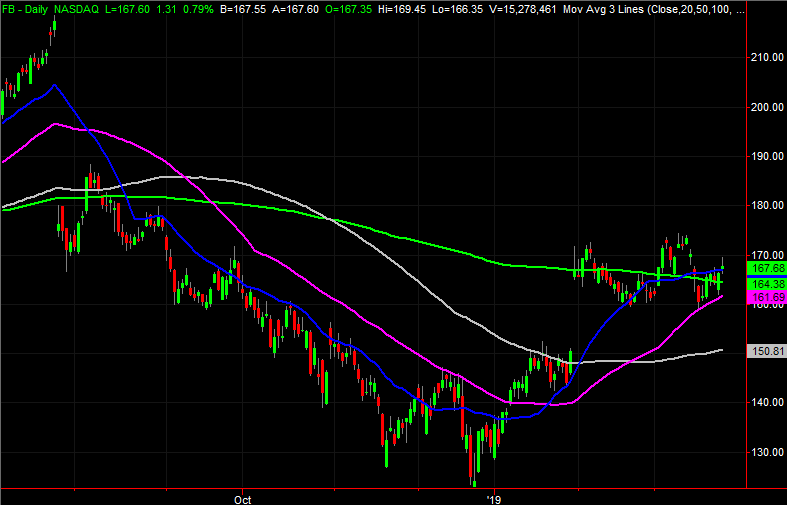 The support line that's guided GOOGL stock higher from its December low remains intact. It's not clear this weakness will go anywhere. AMZN, meanwhile, appears to be everything it seems like it is. The stock moved above a technical ceiling around 1714.50 a couple of weeks ago, and the buyers haven't looked back. The real oddball here is Facebook. Its bullish breakout thrust from late December is just about perfect, and the recent rally has been firm even on bearish days. But, the big gap from late January still weighs on matters... or maybe it doesn't. Traders have had a couple of chances to fill the gap in, but haven't. Maybe it doesn't need to be filled, or maybe not yet. Either way, were it not for the gap, the FB would actually be about perfect. It's not too fast, nor to slow. Also, though not shown above, on the daily chart of Facebook below we can see the stock found support at the 50-day moving average line (purple) to push up and off of en route to a cross back above its 200-day moving average line (green). Are you looking to get more out of the FANG stocks? Try the BigTrends FANG Options Trader Advisory Service, which uses options to leverage the volatile movement of the FANG, or FAANG, names. These stocks alone offer enough action to keep traders as busy as they want to be. And, with a 'universe' of only five names, the BigTrends team is able to know - and spot - all the nuances of the market's most-watched tickers. Learn more here.